Custom cornices can add artistry to any window and make a statement in any room. Because cornices tend to draw the eye upward, they can even make a room seem larger. When it comes to custom cornices, there is no limit to what we can make! We have a variety of cornice styles for you to choose from, or you can supply us with a custom design and we’ll fabricate it for you. Pick your fabric – any fabric – and we’ll make it work! Our cornices are made out of 7/16-inch OSB plywood, padded with Dacron batting, and we can welt them at the top and bottom. We can also decorate cornices with nailheads or other accoutrements. We use #2 pine for the returns and the dustcovers. 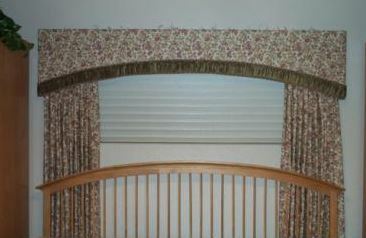 For more information about custom cornices, or to get a price quote, please e-mail contact@draperyworkroomdenver.com. Please make note: Our custom drapery workroom is in Castle Rock, and we’ve been serving the Denver metro area and Colorado since 1986. In addition to custom cornices, we also make other window treatments, including: custom drapery, custom Roman shades, custom valances, custom outdoor drapes, custom room darkening / blackout drapes, and custom thermal / insulated drapes. We offer free pickup and delivery.